When I was waiting at the airport lounge for my flights depature from Amsterdam, I dropped into the airport bookstore before boarding the flight. As I looked through the latest bestsellers, a small book with a simple cover caught my attention. 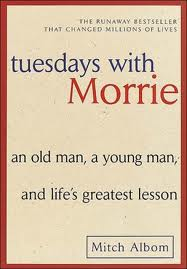 Its title read "Tuesdays with Morrie: An Old Man, A Young Man and Life's Greatest Lesson". The title of the book forced me to purchase that book. After takeoff, I thought I would browse through the book for a few minutes before taking a much-needed nap. A few minutes slipped into a few hours and by the time we landed, I just finished the last page with tears in my eyes. The book is about a man who, after leaving university and building a career, rediscovers his favorite professor, Morrie, in the final months of the olders man's life. Every Tuesday, the former student then visits the dying teacher to learn another lesson about life from this man who lived so richly and completely. A real-life account, the lessons Morrie offers during these moving Tuesday sessions include: how to avoid a life of regret, the value of family, the importance of forgivness and the meaning of death, where he makes the powerful remark, "Once you learn how to die, you will learn how to live." This beautiful little book will remind you of the importance of counting your blessing daily and having the wisdom to honor life's simplest pleasures no matter how busy your life becomes. One my legacies I will leave to my two children will be a library of books that have inspired and touched me. And "Tuesdays With Morrie" will be one that will sit out in front. I can relate! When I first picked up this book years ago I wasn't expecting to read the whole book in one sitting. But- I did. It is such an inspirational book. So glad you had the chance to read it. Great review!